Here are our assets, challenges, and goals for this challenge. Shopping report: I had some ECBs to burn so I did do a little shopping at CVS this week but spent nothing out of pocket. Milk, vinegar, and cat food were purchased and I had a library fine (argh!). Here are my results so far: I spent $19.08 this week which makes my total spending $39.77. Not bad; that is 39% of my budget. How are you doing with your challenge? If you think that we will only be eating beans and rice for the month, think again - our menu plan for the week. Even the Ladies Wot Brunch were served over the weekend using only pantry challenge recipes. Come back Thursday to see what was served! I am so pleased to be joining some talented bloggers Going Crazy Wanna Go?, The Frugalista Chick, , Matter of Cents, Coupon Pals, Thrifty Divas, Frugal Mom of Two, How About Free, TheItMom.com, All The World Is Art, Sweeping The USA, Mommies Point of View, Mama's Money Tree, Crunchy Frugalista, Fab Find Foodie, Making Time For Mommy, Adventures in Coupons, Full Price? NEVER!, The Frugal Navy Wife, Generations of Savings, and A Savings WOW! 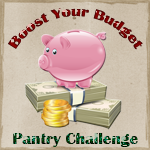 in taking Shopper Strategy's "Boost Your Budget Pantry Challenge" during the month of January. If you would like to join in or see how other folks are facing the pantry challenge, please click through the linkys. You inspired me to dig deep and finish off the month with mini pantry/freezer challenge.